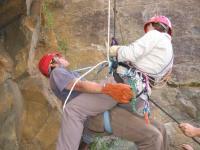 As of January 2004 Outdoor Discoveries has entered into a contract arrangement with the South Regional TAFE (SR TAFE) taking the role of the Registered Training Organisation. 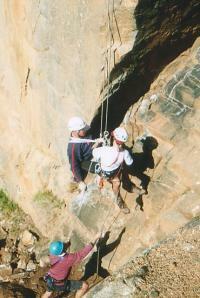 The 7 day course is called the Abseiling and Top Rope Climbing Guide Course (Single Pitch - Natural Surfaces). You will be trained and assessed in nine units of competency and have the option to take part in a skills recognition process for another eight units from national training packages. These units together with a current first aid qualification and a logbook of recent guiding experience will allow registration with the National Outdoor Leader Registration Scheme (NOLRS) run by the Outdoor Council of Australia (OCA). Cut off date for enrolment: Friday Late November 2019. The cost is $1,634.80. Further details here. Cut off date for enrolment: Late November 2019.